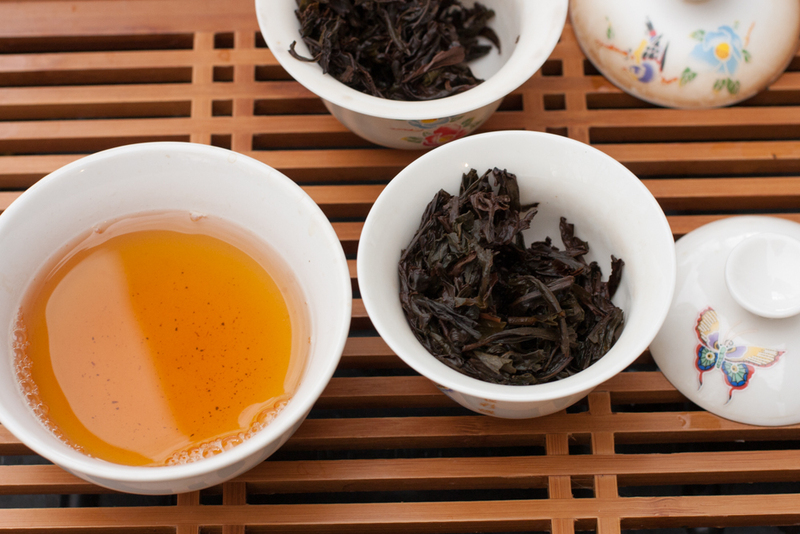 Winter is a great time of the year to enjoy the warm flavors of a roasted oolong such as Wuyi Yancha. White2Tea knows this and wisely included two different samples of Yancha in their December tea club package; the Rougui and the Dahongpao. (Note: this is not the more expensive special aged DHP they recently sold, but is more of a standard offering.) Since I've had a strange winter this year and didn't drink these when they first arrived, I got to enjoy these nice roasted teas out on the patio in March. The great thing about the way they packaged these samples it that they were not labeled. One of the packets was a dark brown smooth plastic material and the other packet was light brown papery material. Of course the club newsletter revealed the identity, but the fun thing to do here is brew these side-by-side and do a blind comparison before looking up which one is which. Good setup for a blind comparison. I put the tea from the papery packet in my satin-finish spring tea garden gaiwan, and the tea from the smooth packet went into my butterfly gaiwan. Despite one looking bigger than the other, both gaiwans hold about 85ml or so, and I used 5g of leaf in each. To make this review less confusing, I'll go ahead and reveal which tea is which. 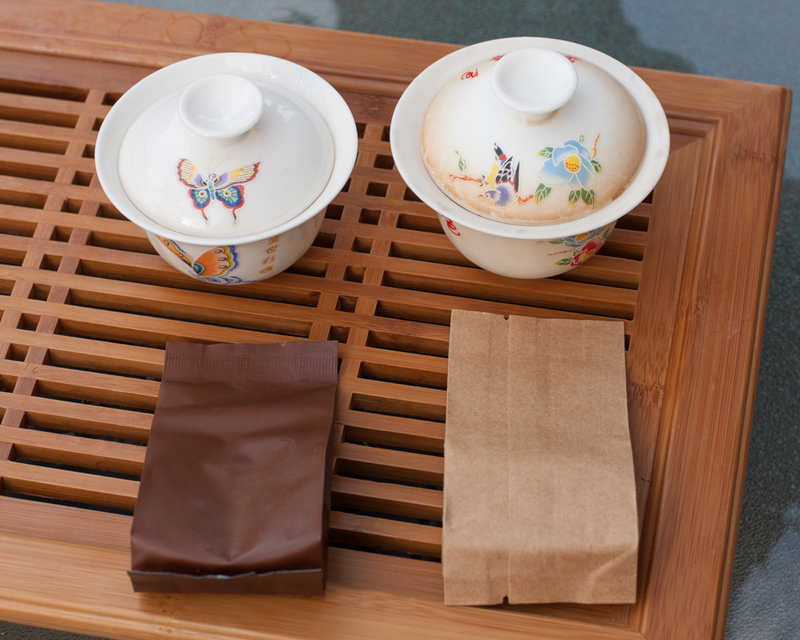 The dark brown package in the butterfly gaiwan is the Dahongpao, and the garden gaiwan has the Rougui. 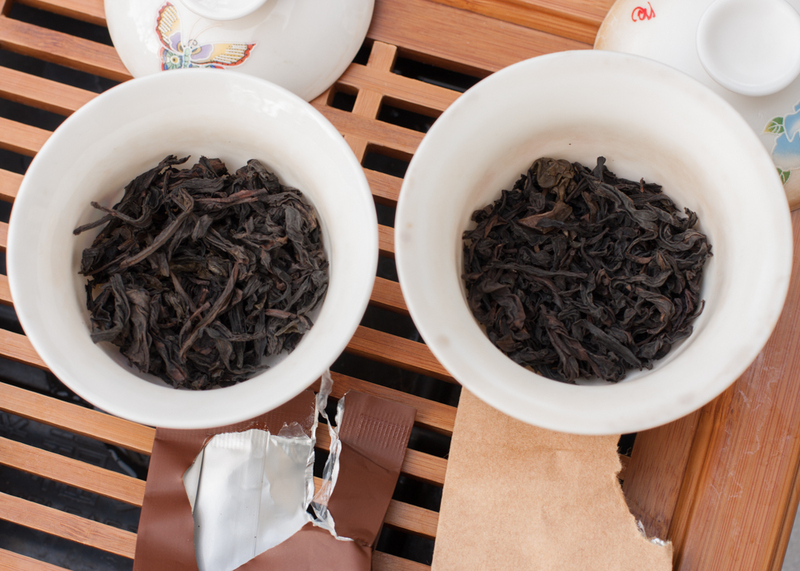 The Rougui leaf is a little bit smaller than the Dahongpao, and the dry leaf aroma is more chocolaty compared to the slightly more fruity aroma of the DHP dry leaf. Interestingly though, the aroma is the opposite once the leaves are wet. The Rougui wet leaf blossoms into an extremely sweet fruity aroma similar to black plums and cherry, where as the DHP wet leaf is not as sweet and almost has an over-ripe fruit aroma, pineapple, with a hint of some kind of melted plastic-like characteristic. This may be due to the charcoal roast. No sense in keeping you in suspense. Dahongpao on the left, Rougui on the right. Both yanchas brew up a similar looking deep orange liquor. The DHP liquor might be slightly more cloudy, but both have a good aroma. Again, the Rougui aroma seems sweeter than the DHP. Upon tasting, it is clear that these two teas are quite different. During my last W2T yancha comparison, I had an aged DHP and a freshly roasted DHP to help learn how the roast flavors can dissipate or evolve over time. From that exercise I learned that the fresh roast flavor can be quite harsh, but I also found it to be very fruity, and it reminded me of guava. None of the two yanchas here have such a young roast profile; however, the Rougui does seem to be closer to that end of the spectrum than the DHP. The Rougui seems very thick and coating in the mouth, but otherwise the mouthfeel is not the strong point of this tea. This tea has a sweet flavor profile of dark cherries which later intensifies into guava, and the aftertaste is just as fruity and seems to show up slightly delayed. Rougui has nice deep orange clear liquor. The Dahongpao has a much different mouthfeel. It has slight astringency and a certain sour characteristic which causes some puckering of the sides of the tongue. The taste is much more acidic compared to the Rougui, and not as sweet. The flavor is significantly more mellow and seems to have a higher degree of complexity, though I found it difficult to explain why. The later infusions have a slight cotton candy-like flavor, but it is not sickening sweet. The aftertaste has the apple taste that I love in a good roasted tea. Dahongpao liquor is similar to the Rougui. The leaves seem slightly bigger though. In comparison I cannot really say that one of these teas is better than the other. The Rougui will appeal more to someone wanting a very sweet and fruity yancha that may come across as a bit harsh to some, though I did find that the later infusions did round out quite a bit and became more balanced. The strength of the Rougui is aroma and sweetness. 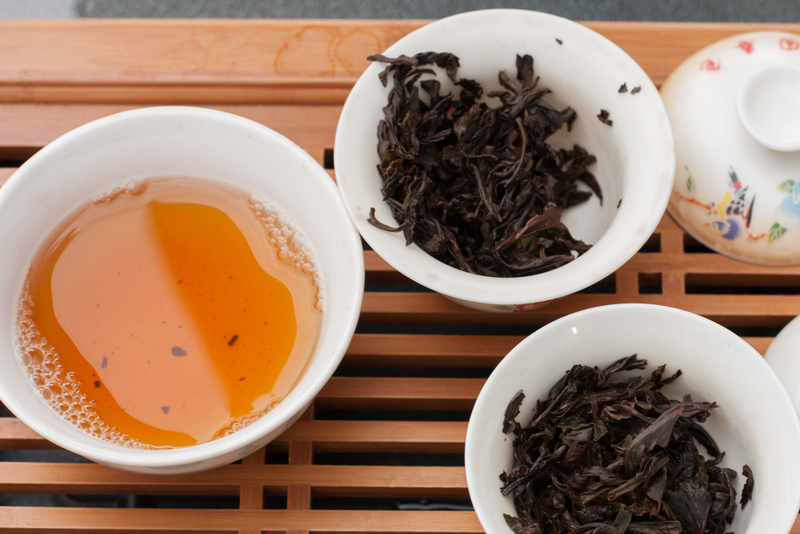 The Dahongpao will be more appealing to someone looking for a more mellow flavor. The Dahongpao's wet leaf aroma may not be as pleasant, but the strengths are in the interesting mouthfeel, nice well balanced aftertaste, and a sense of more complexity. It's great though that both of these teas do have some depth to them and aren't just full of an overpowering generic "charcoal" taste. I cannot say that I have enough experience to know if the acidic flavor and slight sourness in the mouthfeel of the Dahongpao is the result of something good or bad or if it's just a natural characteristic of this tea. I have heard that some oolongs can develop sour notes as they age and absorb moisture, which is why re-roasting from time to time may be done, but I do not know if that is the case here or not. I personally found myself favoring the Dahongpao over the Rougui. I liked both teas, but I found the Dahongpao to be more interesting and more relaxing to drink.